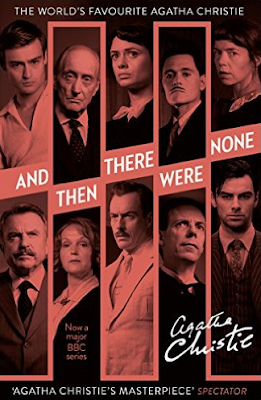 This was my first foray into Agatha Christie, and I was a little bit naughty; I watched the recent BBC mini series before I read the book, meaning I already knew who the murderer was going into it. I didn't mind that too much, though, because from a writer's perspective it was really interesting for me to see how she'd written clues into her prose which, if I were going into it blind, I wouldn't have picked up on. I also noticed that Vera, one of the main characters out of the ensemble cast, had a lot more agency in the adaptation than she does in the book. Perhaps I'd think differently if I hadn't watched the adaptation first, but I actually preferred the mini series to the book. That's not to say Agatha Christie wasn't a great writer. I'll admit her writing style was a lot simpler than I was expecting, but there's no denying that this woman was brimming with ideas and I can see why And Then There Were None is considered to be her masterpiece. It's completely separate to Poirot and Miss Marple, and a lot more sinister. She deserves all the praise she gets for creating this story. However, I felt as though this book could have been truly great if she'd spent a little more time on it. I don't think she rushed it - I don't know how long she spent writing it at all, perhaps it was years - but there were times when it felt as though she'd thought of a story that she didn't quite know what to do with. The way events plan out is clever, it's only when she tries to explain how everything happened that, to me, it felt a bit weak. It was a quick, easy read, though, and if you like your mysteries and whodunnits I recommend giving it a try! I've never read any Agatha Christie. :X I would like to though. Great review!